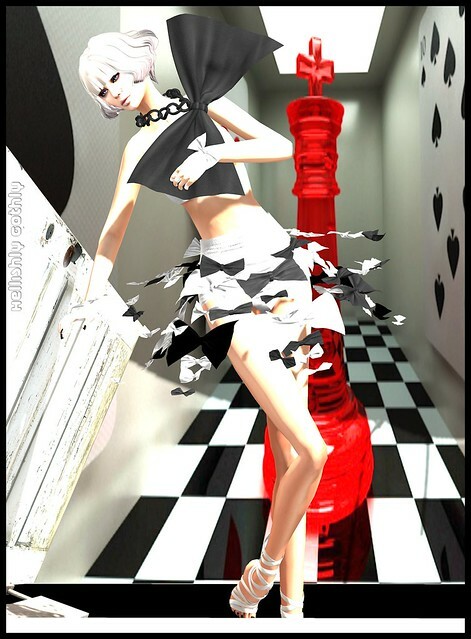 Today I'm featuring this stunning outfit by Zibska for the inaugural round of ReVamped. The top is a bandeau, almost covered at the front by a giant bow suspended from a thick chain around the neck. The skirt is actually form-hugging high waisted shorts, with a skirt attached made up entirely of bows. Each individual part is colour change, with the bows on the skirt having 2 separate areas of colour to enable two-tone. The whole creates a visually eye catching outfit that will turn heads wherever you go. The lovely skin I am wearing is from Essences and available at The Gacha Garden. There is several skintones and make-up choices to pick from. The hair is from Tableau Vivant and is available at this current round of Collabor88.